Fall is in the air, and with Fall comes a bunch of delicious apple and pumpkin treats. New York City offers a bunch of unique Fall treats that you should try before the season ends. Here are a few of the best you should try before the end of Fall. Tullamore D.E.W. Irish Whiskey and The Doughnut Project have partnered to create the D.E.W.nut, a delicious doughnut celebrating the seasonal release of Tullamore D.E.W. Cider Cask, the first whiskey to be finished in hard apple cider casks. The doughnut is made with Tullamore D.E.W. Cider Cask Finish-infused apple filling, topped with the whiskey infused glaze, whipped cream and a pie lattice, and will be available for $4.75 at The Doughnut Project’s 10 Morton Street store for a limited time from October 18th – October 30th. Tis’ the season to break out the pumpkin, and if you love pumpkin and caramel, then this is what you’ve been waiting for. 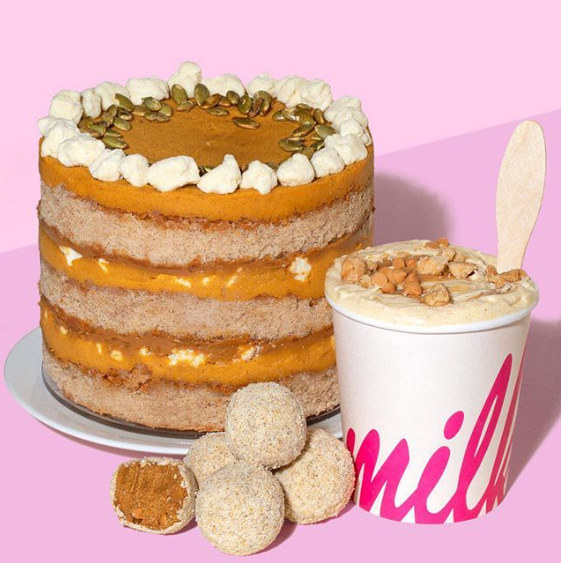 Milk Bar offers pumpkin in the best way possible with their Pumpkin Dulce de Leche cake. It’s made with a spiced vanilla cake, then layered with roasted pumpkin ganache, dulce de leche and milk crumbs. The cake is completed by topping it off with toasted pepitas. 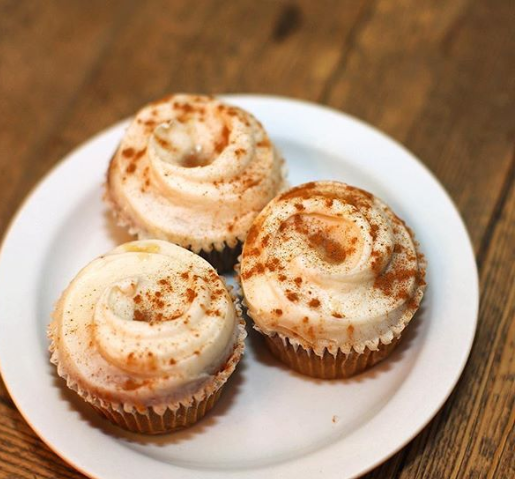 Who doesn’t love pumpkin spice especially in the form of a gourmet cupcake? These yummy little cupcakes are made with real pumpkin purée and get topped with maple cream cheese frosting and a dash of cinnamon. These cupcakes are only available in the fall, so you’ll want to get them fast before they all sell out. For the cinnamon and apple lover in your life, The Cinnamon Snail is your place to go for your Fall treat. The Cinnamon Snail is an all vegan cafe that offers gluten-free options as well as sandwiches and other goodies. For the Fall, The Cinnamon Snail is offering customers apple cider donuts. Their apple cider donuts are rolled in cinnamon sugar, and the best part is they’re inexpensive. Get your fill of apples in this Apple Cinnamon Crumble from Doughnut Plant. It’s as apple-ly as it gets! The Apple Cinnamon Crumble is made with the Doughnut Plant’s limited edition doughseed. These doughnuts are filled with their housemade apple jam, then topped with their cinnamon spice crumble. Don’t miss your chance at a great taste of apples! Jeremy@offthemrkt.com to tell us more! Follow Off The MRKT on Twitter and Instagram, and like us on Facebook.